A female whooping crane named Hemlock cared for her two chicks at White Oak Conservation this spring. 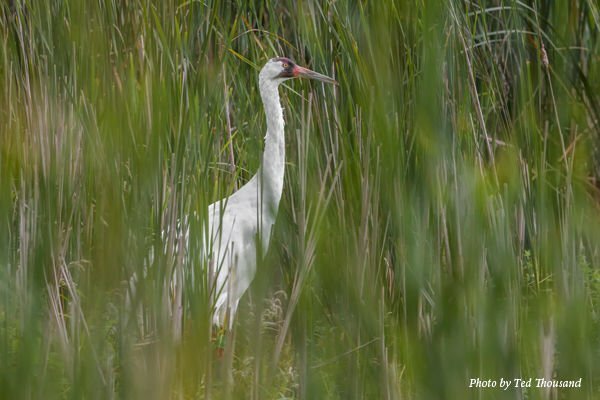 A whooping crane named Grasshopper was pictured here upon his return to Wisconsin. A reintroduction success story took place recently when a whooping crane family returned to Wisconsin, flown north courtesy of Windway Capital of Sheboygan. The family will call the marsh its home until they migrate south on their own again this fall. They will be monitored by staff of the International Crane Foundation, as part of the Whooping Crane Eastern Partnership. 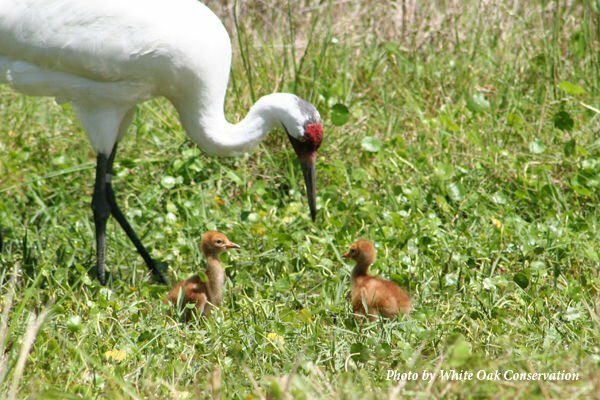 “This story — still ongoing — is really an enormous success for whooping cranes, and reintroduction science, due to the experimental nature of this pairing,” said Anne Lacy, International Crane Foundation crane research coordinator. The patriarch of the family has a colorful history. Grasshopper was raised at the International Crane Foundation through the Direct Autumn Release Program. He was released at Horicon National Wildlife Refuge in 2011. In 2015, the International Crane Foundation discovered that Grasshopper had paired with a sandhill crane female at Horicon National Wildlife Refuge in eastern Wisconsin. This pair had a hybrid chick in the spring of 2016. As this was not in the plans of the whooping crane organization, the chick was captured and brought to the International Crane Foundation, where he happily resides today. In hopes of re-pairing Grasshopper with a female whooping crane, he was relocated in the fall of 2016 to White Oak Conservation, a private, accredited facility in Yulee, Fla. There, the partnership undertook a never-before-attempted experiment — trying to create a new pairing and return the new pair back to the wild. The partnership choose a more appropriate mate for Grasshopper, a female whooping crane named Hemlock. She was costume-reared at the International Crane Foundation, but not released as a chick for health reasons that have now been resolved. As cranes are famous for being very particular in choosing a mate, the WCEP partnership waited to observe what would happen after introducing the pair. “Thankfully, it didn’t take long for them to exhibit friendly behaviors,” Lacy said. “Within the year they were unison calling together and flying circles around their large enclosure.